With the design phase now completed, your manuscript and the design brief will be sent to a typesetter, who will take your text and illustrative material, setting it out on the page ready for printing. There is a lot more to typesetting (and its sister, typography) than you would think. Both have their origins in the Gutenberg revolution and each, in their different ways, were concerned with the presentation of textual material in type format ready for printing. In earlier times there was a big difference between them. Typography was the art of designing, setting and arranging type whereas typesetting was the process (or craft) of actually setting the type. Note the class difference: typography wore a beret and twirled a designer’s pen, typesetting wore an apron, punched type and had ink on its fingers. As we shall see, however, the differences between the two have blurred in recent years. Together, typography and typesetting combine an art and process that only really succeeds when invisible. In many respects, the layout of your book is comparable to the background music added to a film. Its primary duty is to make your text clear and accessible, but ideally it should also enhance the meaning with mood and style. Though stylish, the layout must also be durable (indeed timeless), transcending fashion. Much creative energy goes into this art, which is the subject of passionate debate among its practitioners. The differences between typesetting and typography have narrowed (even blurred) due to the digital revolution and advent of desktop publishing (DTP), which has virtually obliterated other forms of typesetting in recent years. At the sharp end of publishing – in the production of books, journals, etc. – the old, quite laborious and expensive process of producing print-ready material by hand-setting individual lines and pages of type (a job for well-paid tradesmen) has given way to on-screen, WYSIWYG page composition using personal computers and (usually) lower-paid semi-clerical staff. In parallel with (and a precondition for) this transformation was the development of things we all take for granted today (everyone, not just publishing professionals) – the personal computer, DTP software, new digital fonts (see below), laser printers using the Postscript programming language, and PDF (which renders Postscript into a viewable, WYSIWYG format). An even more recent addition has been the arrival of text mark-up languages like XML; originating from the old pre-DTP typesetting systems, these are still esoteric, even for many publishing people. At the same time that the process of page layout has been transformed, a parallel transformation has been seen in typography. 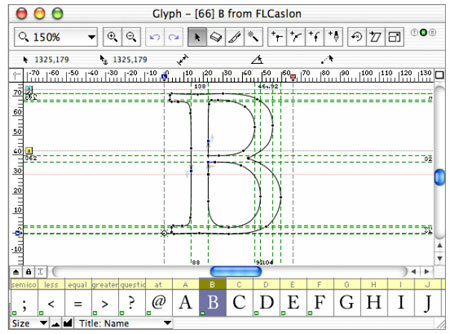 Here, there have been huge advances in typographical design, not least the development first of scalable, digital fonts followed by an explosion of new designs and more recently the digital capture and standardization of all the world’s varied alphabets and scripts in the form of Open Type fonts. These advances have been an essential feature of the digital revolution in publishing. Without them, there would be no #e-publishing, no e-readers like the Kindle, probably no iPhone or other smart phone, and indeed even the PC, Web, etc. would be far more limited things than they are. Fit your text and illustrations into the agreed page extent. Place text and illustrations in an effective and appropriate combination. Apply a layout that is uniform and predictable. Implement a design that is elegant but also clear and readable. Deliver the print-ready PDF files on or before the agreed date. Such is the world of the typesetter. But, as shall be seen in my next post, this esoteric world about to impinge on your own. I’ve been back from Frankfurt a week now and this is my first post in weeks. So much for the live update that I had planned. The problem is that the wireless connection on my Macbook Pro is broken, a major hassle that made communication at Frankfurt rather difficult. Must get it fixed (when I can afford to be without the laptop for a few days – sigh). Anyway, Frankfurt was somewhat subdued, far fewer editorial types in evidence than usual and the usual hype over bidding wars for the latest Dan Brown or whatever was unconvincing. Even the end-of-day receptions at different stands seemed ho-hum this year. But the significant revelation for me was when one of our regular buyers, a guy called Holger, pointed out that the aisles in Hall 8, where as usual our stand was (and where most of the other English-language presses hang out), were wider than usual. So I strolled to the end of the hall and looked. Holger was right. There were about 3 rows of booths fewer than usual. The recession is biting, if only a bit. Sadly, one of the casualties was The Guardian, whose attendance in its usual slot in row B was in the fair catalogue but at the last minute was replaced by some publisher or other. Normally, the good people from The Guardian dish out free copies of the newspaper, hoping we’ll be tempted to subscribe. Obviously, not enough of us have been doing so. Every few days another e-reader is launched. There were a few at the fair. One looked interesting but incredibly the exhibitor had it behind a plastic shield so actually twiddling with it was quite impossible, a huge turn-off. Just before Frankfurt, Amazon went (almost) global with the Kindle. Interestingly, this did not seem to make the splash at the fair that I assume Amazon had expected. The Kindle has some nice features (not needing to upload its content from a PC, for instance) but increasingly its power-saving e-ink technology is being seen as drab (no colour) and the machine lacks some of the wow stuff you’ll find on an iPhone. And rumours persist of an Apple tablet that blows the Kindle and the other e-readers out of the water. Not surprisingly, perhaps, despite the ever frenetic hype about digitization and e-sales, I felt there was a general wait-and-see attitude beginning to be noticeable among publishers. Their core profits remain in print sales, despite 400% increases in digital sales here and there (four times very little is not much more, no matter how impressive the increase may sound). Also, publishers remain wary about Amazon getting to dominate the e-book market. But Google’s ‘land grab’ (as some have put it) in the e-world is potentially more revolutionary. To me, it seems more and more likely that the Google Book Settlement – an American legal settlement but with global effects – will be challenged by the European Union. And if Apple and Microsoft enter the fray? All hell could break loose. Finally, I found it interesting that this year the guest country was China (you may have heard about the ham-fisted attempts to stifle the voices of dissidents at the fair) but in business terms the Indians made a far greater impression. Not only were Indians selling a profusion of different publishing services (they now dominate globally in pre-press services and maybe have already overtaken the Chinese in printing services) but Indian publishers are increasingly visible – and confident – as buyers as well as sellers of publishing rights. As always, my various Indian visitors were charming, often witty. In contrast, the Chinese were only interested in selling, and little thought seemed to being put into getting onto the wavelengths of Western publishers, i.e. into tuning into how to open their wallets. It is a bad idea to run a night-time seminar for PhD students on ‘Getting Published’ if you haven’t had your dinner. Come to think about it, no matter what its subject is, running such a meeting without food and not finishing until after 10 p.m. just isn’t smart. Well, that’s my excuse for my negative attitude at a session that I ran in Norway recently. With me at the seminar was a librarian who shared her vision of the future. Where once her library had shelves and shelves of journals, now almost everything is online. Half the shelving has disappeared. The rest is used to hold various newsletters that probably no one looks at and the few journals still determinedly holding out against the digital future. The monograph collection is next. Within five years, she announced, 80% of her library’s book acquisitions would be e-books. The printed book has a limited future. In short, I forgot an essential requirement of being a book publisher: being positive. Sorry. So is it only doom and gloom? The global economic recession is starting to bite. Someone I was talking to the other day works for a company selling specialist equipment to businesses around the globe. He glumly revealed an 80% drop in sales. British high-street booksellers are praying for a Christmas lift in their sales but so far the talk is of a 5–10% fall in sales since this time last year. On the other hand, academic sales seem to be holding up for now. For instance, earlier this week, Wiley (which is a significant academic publisher but probably is more known for its books for accountants, lawyers, architects and the other professions) announced a modest increase in sales compared with last year. It was indeed academic and educational books that kept Wiley in the black, whereas professional and trade (general public) sales plunged 12%. For what it’s worth, this is substantiated by my daughter; she recently started university and complains about the number of books they are supposed to purchase – and the prices. Elsewhere, not many weeks ago, the general publisher Bloomsbury acquired the respected Oxford academic press, Berg, and via this platform is launching an academic list whose titles will all be free to view and download. Bloomsbury are gambling that sales of printed copies will hold up or even increase because the free digital copies will help promote these sales. We shall see. The publisher wryly notes, ‘If I’m right, we’ll be profitable. If I’m wrong, I’ll get kicked out’. If Wiley are making money in academic publishing, what kind of material is this and in what format is it published? Bloomsbury is not the only academic publisher offering free content. What exactly is this approach, how does this work, and what does it mean for authors? Amazon.com says it’s selling a lot of e-books for use on its Kindle e-reader, which apparently is now sold out (several weeks before Christmas). No more stock will be available until the Kindle 2 is launched in February. Meantime, over on Apple’s iPhone, downloads of the Stanza e-book application have vastly exceeded Kindle sales and tens of thousands of new titles are being added every few weeks. Has the e-book revolution finally taken off? The Book Expresso machine is slowly spreading across the globe. Recently, the first such ‘ATM for books’ to be installed in an actual bookshop went live in Australia. What future has the modern-day bookshop? Will it end up as a book kiosk and coffee shop? Certainly, for authors the future need not be bleak, even if the book seems to be evolving into many different formats. In short, I had no excuse to be so negative. And maybe I should have put the perspective of my librarian colleague in a broader (more positive) publishing perspective. I’ll have to think about doing that more in future.